Dozens of tornadoes ripped across the Midwest, killing at least six people and injuring dozens more with powerful winds that destroyed many homes. 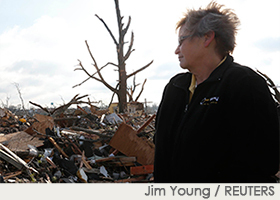 Lutheran Disaster Response is working with our partner affiliates on the ground, assessing the immediate and long-term needs of those affected by the tornadoes. Your gifts are needed now to begin coordinating volunteers, rebuilding homes and offering spiritual and emotional care to those in need. Gifts designated to “U.S. Tornadoes” through Lutheran Disaster Response will be used entirely — 100 percent — to help survivors of tornadoes rebuild their lives and livelihoods. Join our disaster work and help provide the type of immediate and long-lasting support that is already underway in the affected regions. Make checks payable to Lutheran Disaster Response. on your check's memo line. Looking for the perfect gift? ELCA Good Gifts make a real difference in the world.